My little bird turned one year old last Friday! 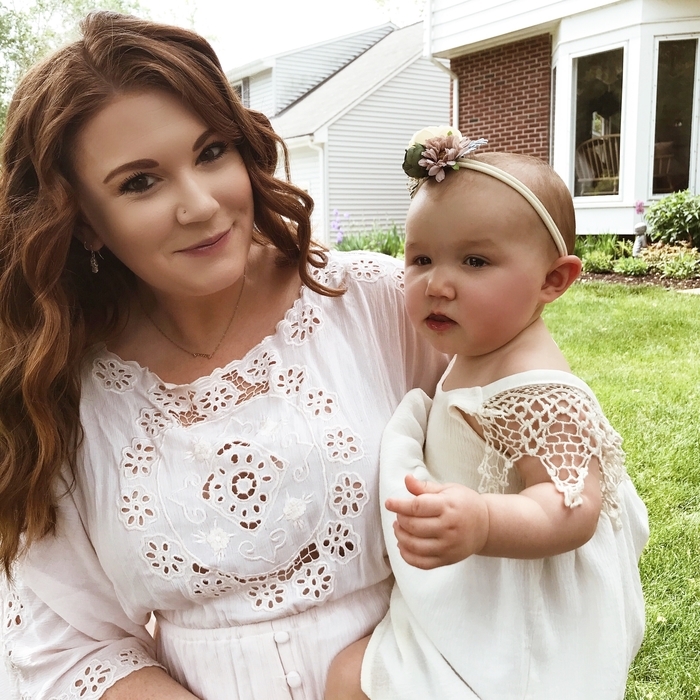 I can't believe it - this year has totally flown by... and Marin is looking more and more like a toddler, and less like a baby every day. 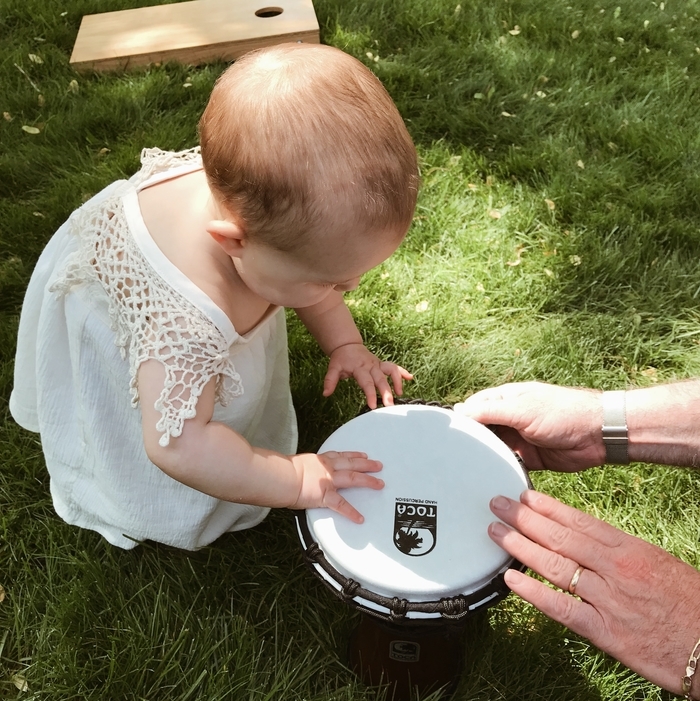 In all honesty, it has been really bittersweet watching my daughter get older - because while it is so exciting to see her learn and grow with each stage, I feel this underlying sadness that she is not a baby anymore. It is hard to explain, do any of you other mamas out there get this same feeling?? 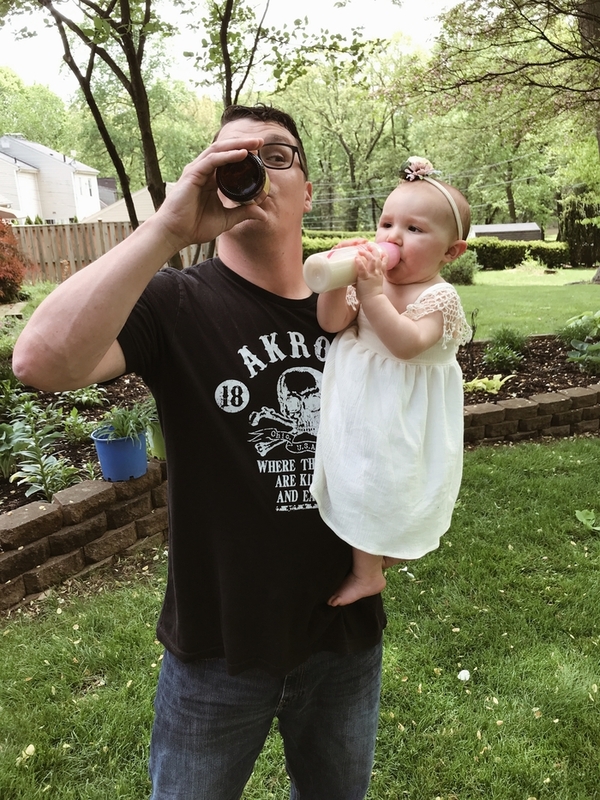 Anyway, we had her 1st birthday party last Sunday up in Akron with all of our friends and family. It was held at Aaron's parent's house, mainly in their backyard, which was amazing because the weather was perfect and all the kids could run around and play! 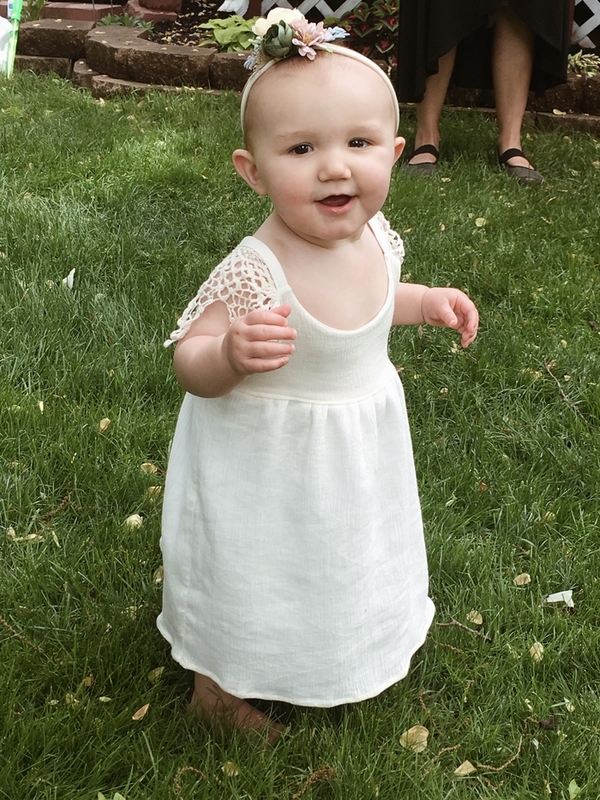 The party was such a success - everyone had a great time, especially Marin. She was such a trooper throughout the entire party...she didn't cry, melt down, or fall asleep once. We were amazed! She did completely poop out and nap the entire 2-hour drive back to Columbus though. 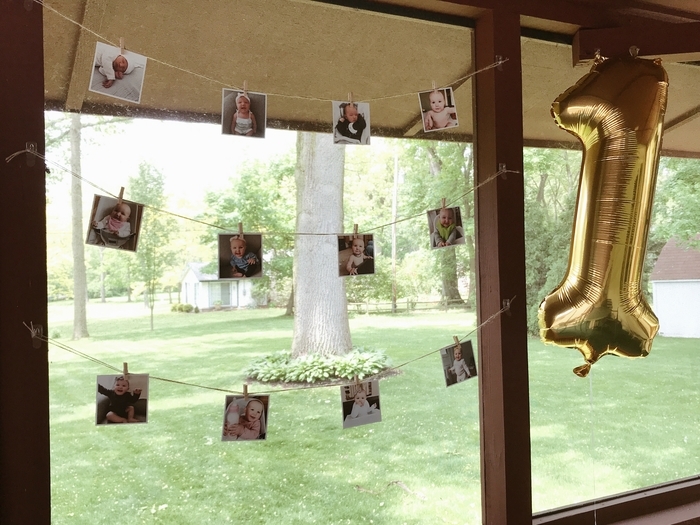 I kept the decorations pretty simple - didn't want to get too carried away since she is so young and we had the party 2 hours away from home. So, anything that we needed, we had to pack up and travel with. I got some flowers and balloons from the local grocery store, and used a lot of things from our wedding actually! 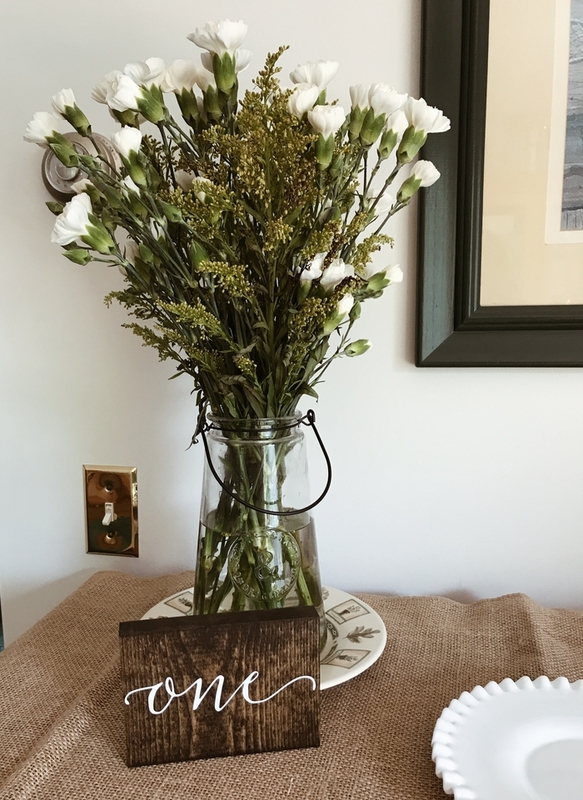 Burlap table liners, one of the wooden table numbers, and some of the plates and cake stands. 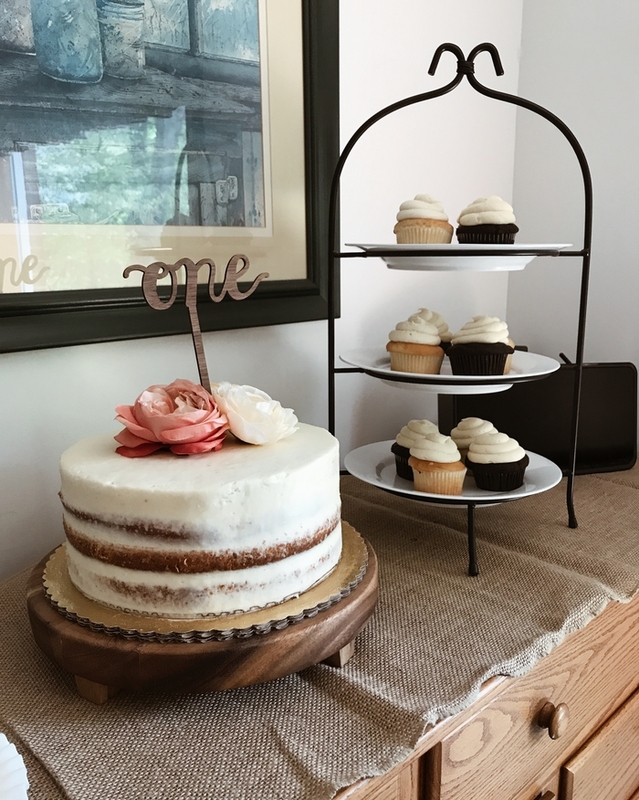 I did pick up this cake stand from Target though because I loved the look of it, and knew that I would use it again for many other things. 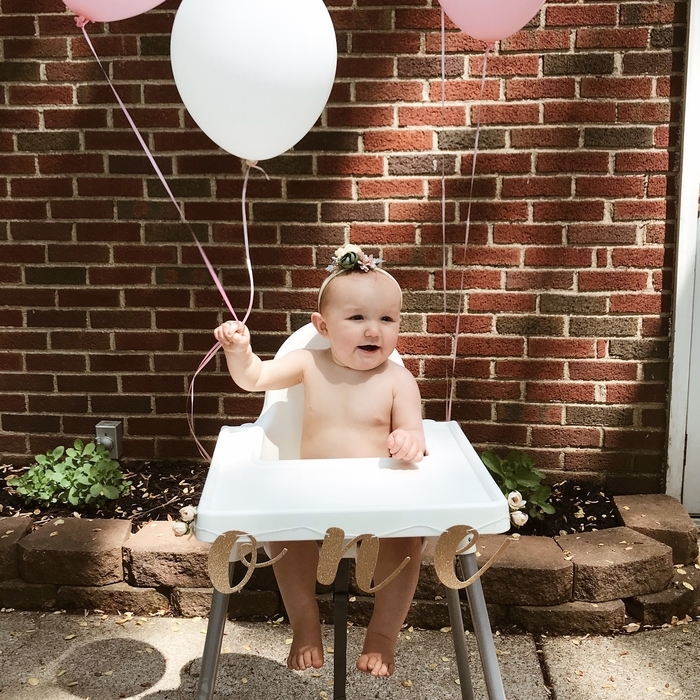 Another thing I ordered was a "one" banner for her highchair - I wanted to dress it up a bit since I knew we would be taking a lot of pictures when she ate her cake. I ordered all the cakes and cupcakes from a local Akron bakery called West Side Bakery. I couldn't have been happier with how they turned out - they were gorgeous AND delicious (super important). The large birthday cake and Marin's mini smash cake were both naked cakes with white cream cheese frosting, and the cupcakes were a mix of yellow and chocolate cake with the same frosting. 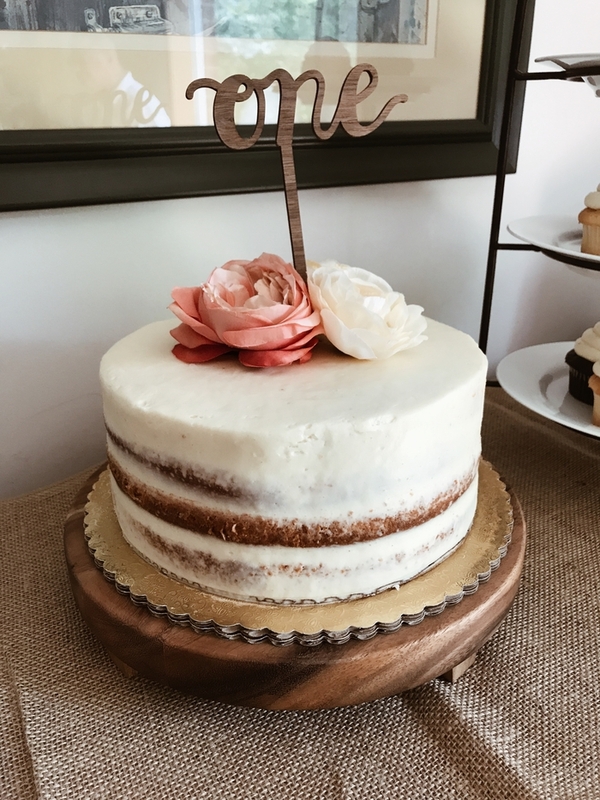 I ordered some faux flowers off of Etsy to decorate the top of the large cake and the smash cake. I was really happy with them - they actually almost looked real! And I was able to clean them off after the party so that I can reuse them some other time. 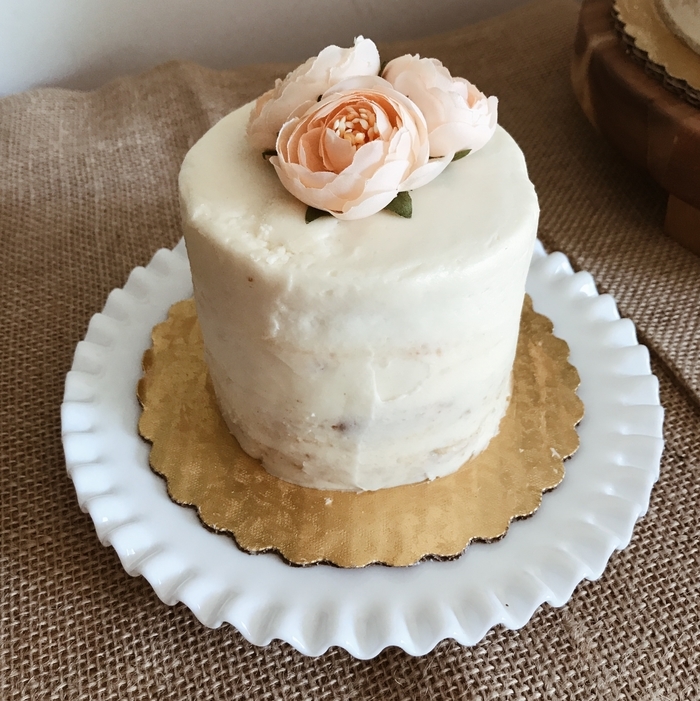 The store I purchased them from is called Simply Serra Floral. The "one" cake topper was also from Etsy - a store named Alexis Mattox Designs. It shipped very quickly, was really high quality, and super reasonably priced! Marin LOVED her cake (clearly - as you can see above ha! )...she was a bit timid with it at first, just dipping her fingers in the icing and licking them. But after a couple of tastes, she started to really dig into it and get handfuls. I had to eventually cut her up a piece and take the rest away, or I think she would have tried to eat the entire thing! 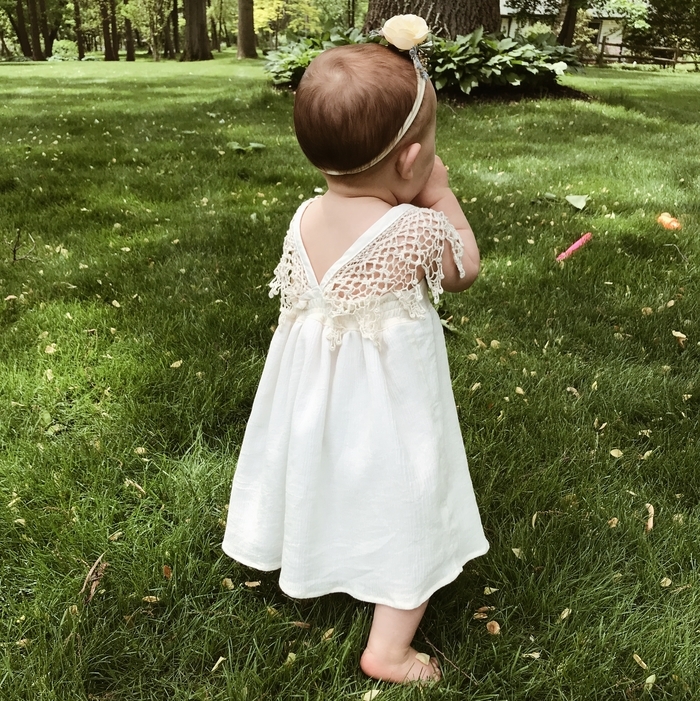 As for Marin's outfit - I got the absolute CUTEST dress from an Etsy shop called Bitty Bambu. When I found it, I thought it was just perfect - and it looked super comfy for her to run around in too! Her flower headband was also from Etsy (sense a pattern here? )...a store called Hey Babe Props. 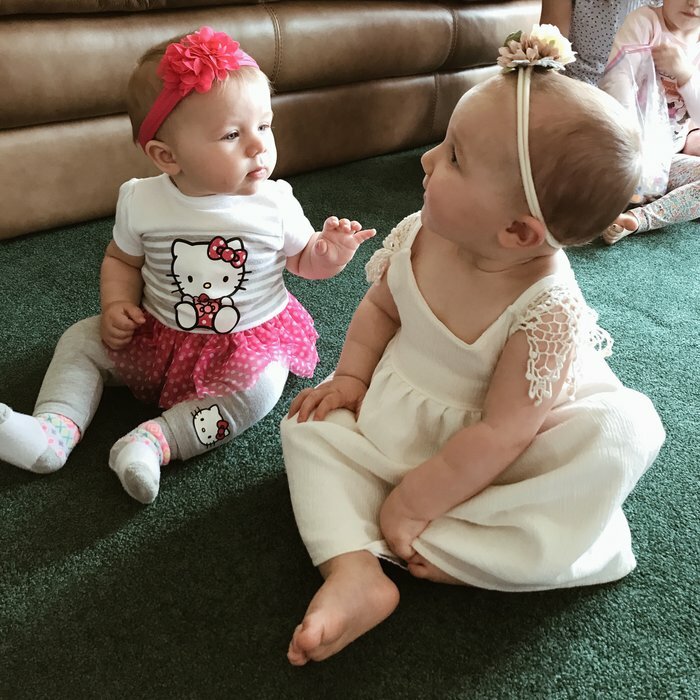 I had a hard time narrowing it down to one - so many of their headbands are so cute! Meeting my best friend's daughter, Emma for the first time! One of my favorite parts of the party was seeing Marin get to play with all my friend's children. She hasn't really gotten to meet most of them before - or she was a newborn when she originally "met" them. One of my best friends from middle school is Michelle (who is still my BFF to this day) ...and she has a 2-year old son and an 8-month old daughter. 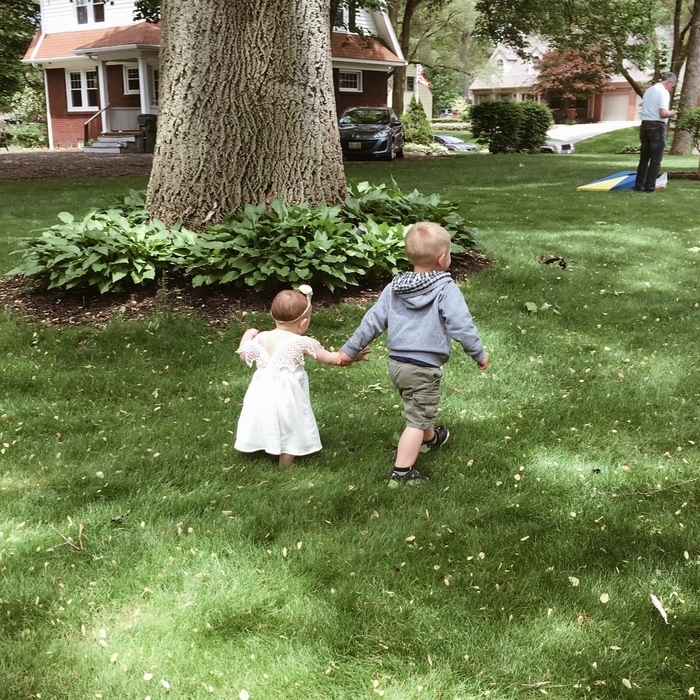 Marin loves them both so much - and I have to say, it's amazing to see your child love and have a great time with your friend's children! 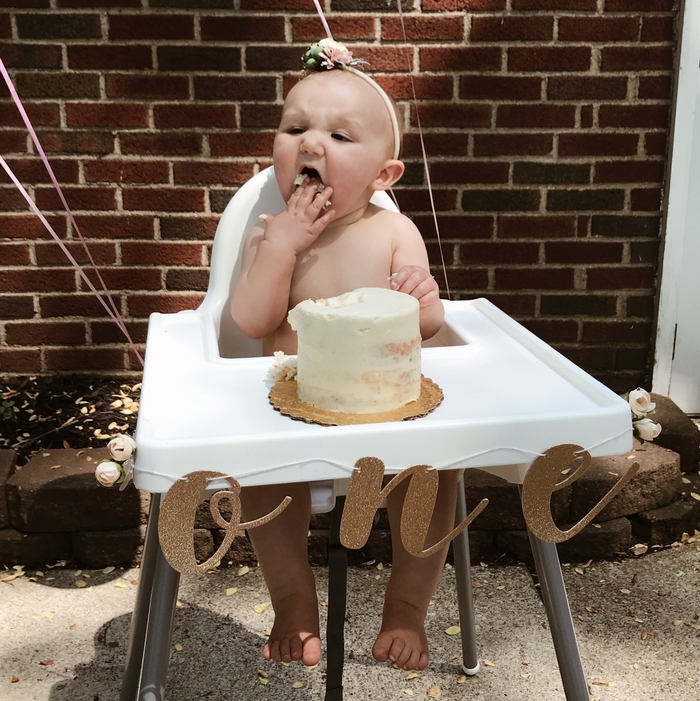 aww can't believe she is one! happy belated birthday to her.